We are a ganddaughter(Hannah), grandfather team and have been raising poultry for the past three years together. Grandpa been doing it alot longer but he's still learning. 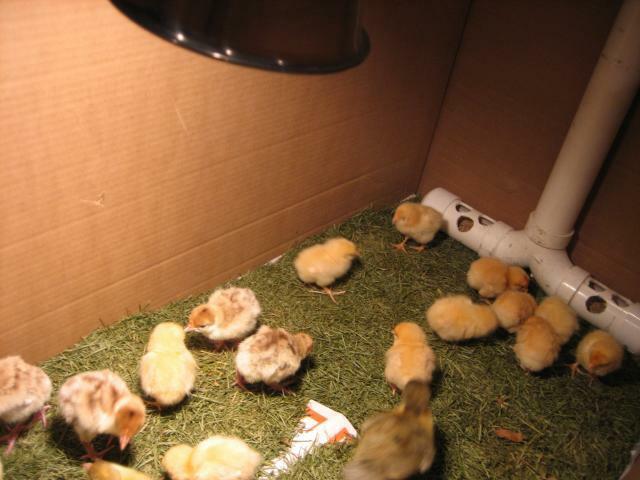 We started with day old chicks from Cackle Hatchery and got our first chicks in the mail. 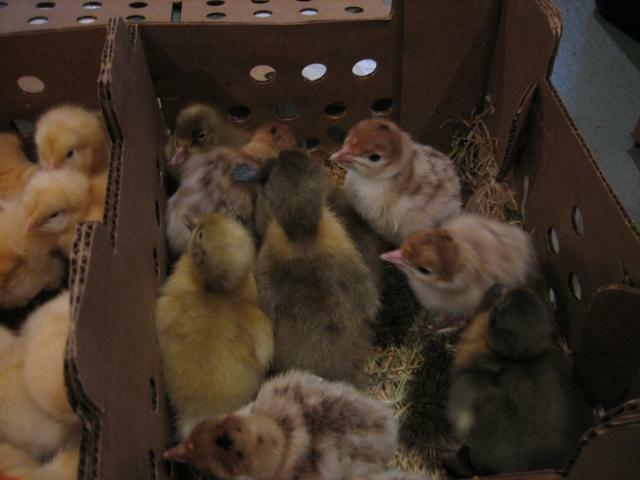 Our first brooder contained Buff Orpingtons, Blue Swedish ducks and Burbon Red turkeys. They were raised all together and did well, except the turkeys which kept flying out of the pen and getting killed by a dog. Grandpa ended up selling the ducks and some of the chickens. The next year we ordered chicks again. We got more Burbon Reds and Millie Fluer D'uccle bantams. Grandma was mad that we sold her ducks so we ordered some Grey call ducks but something killed them all so grandpa says no more ducks. Also one of our BO hens went broody twice and hatched out some nice chicks. We got rid of most of them but we still have two of her cockrels. We're getting too many roosters! This year we are trying something new, an incubator. We got an LG unit with a fan and auto turner with racks for chicken and quail eggs. For our first hatch we used some of our own chicken eggs and were able to hatch 19 little chicks, mainly BO but we got two of the bantams. 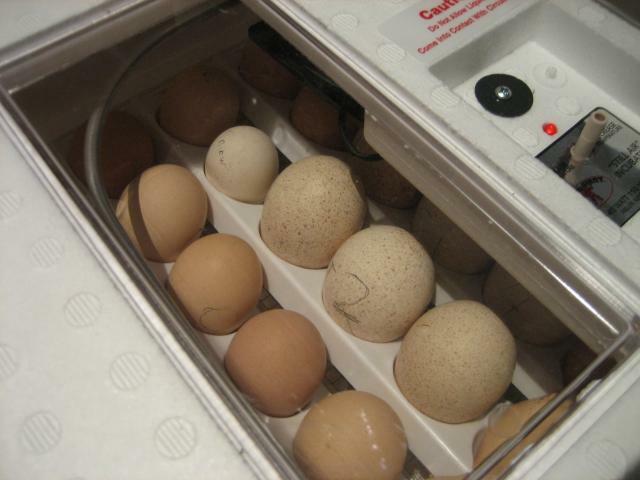 The second batch is in now and the incubator is completely full. This time we are trying some of the turkey eggs and we purchased a dozen Blue Laced Red Wyandotte hatching eggs along with some more of our own chicken eggs. Hope they all hatch. 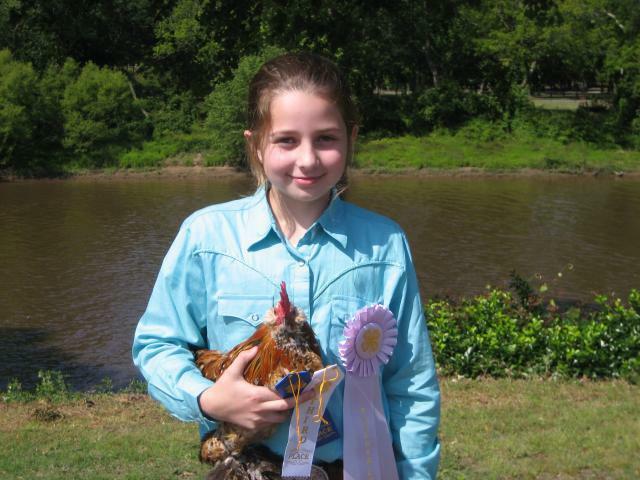 Last fall Hannah entered a local festival with one of the D'uccle cockrels and won a first place ribbon. This year she is going to try again with some of the other birds and see how they do. The next event is in about a month where she will be showing one of the bantam hens. Wish her well! All and all it has been an enjoyable and educating experance. Wonder what we will try next? I keep thinking about the quail racks for the incubator that haven't been used. 5/15/11- Just a update on what we have been doing lately. Hannah entered Alvan, her D'uccle rooster, last weekend and did well. Third place on showmanship, first place bantam and Grand Reserve of show! Both her and I are real proud. Our last hatch did okay. We hatched some of our turkeys, BO chickens, D'uccle chickens and BLRW chicks. We have another batch due the 23rd, but that will probably be it for a little while. 2/4/12- Things have changed a bit since our last posts for those of you who might be intrested. Our Orpingtons and D'uccles are gone, we also sold all our turkeys. 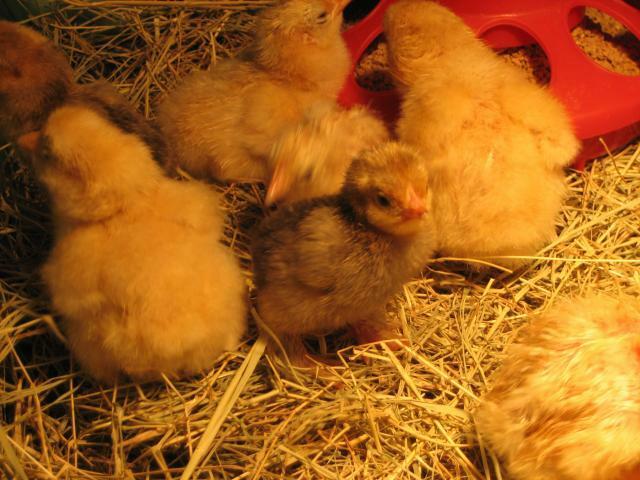 So this past fall we ordered more chicks, this time from Privett Hatchery. Production Reds for eggs, Welsummers and more D'uccles for fun. Also we hatched out a bunch of Jumbo Brown Coturnix eggs at the end of January. The Quail are the quickest growing and hungryest little things I ever seen. We are happy with our first attempt at these birds.